WASHINGTON, DC, U.S.A., April 8, 2015: The crowds of attendees and the clamor of working equipment that filled the giant exhibit halls at NPE2015 told the story better than numbers, but now there are statistics to make it official: NPE2015 was the largest show in NPE history. SPI: The Plastics Industry Trade Association, founder and producer of NPE: The International Plastics Showcase, has released final data for NPE2015, which took place March 23-27 in Orlando, Florida. The data shows NPE2015 attracted 2,029 exhibitors over 1,128,200 net square feet (104,813 sq.m) of exhibit space—exceeding the previous records of 2,009 exhibitors and 1,041,000 net square feet (96,712 sq.m) set in 2000. 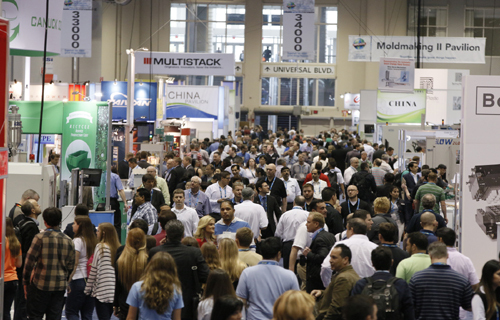 In addition, registered attendance for NPE2015 was 65,810—19% greater than three years ago. These registrants came from 23,396 unique companies—22% more than the 19,198 companies at NPE2012—representing a substantial increase in buying potential. International participation also set new NPE records. Nearly 44% of exhibiting companies and 26% of registrants came from outside the United States. Nearly 5,000 registrants were from Latin America alone. Exhibitors came from 37 nations in all. In descending order of number of exhibitors, the ten largest participating countries are China, Taiwan, Canada, Italy, Germany, India, Turkey, France, Switzerland, and South Korea. These figures don’t include many companies that are based in other countries but exhibited through their US subsidiaries.